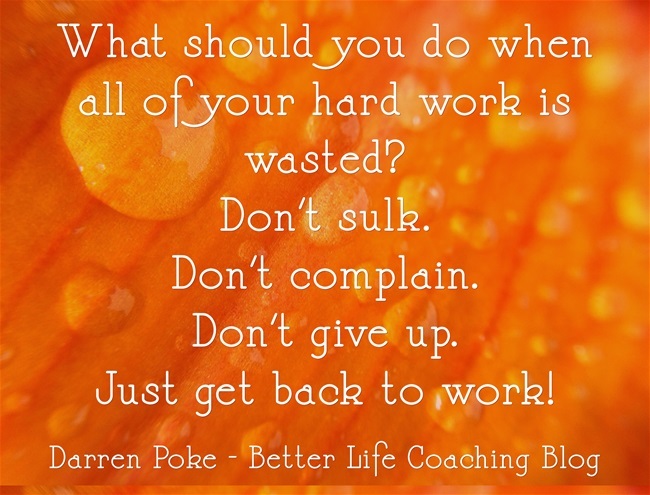 What Should You Do When All Of Your Hard Work Is Wasted? I was watching David Attenborough’s latest series, Life Story, this week and one of the featured animals was a beautiful male flame bowerbird who had spent weeks meticulously building a bower to attract a female. It was extraordinary to see the level of care and detail that went into his creation as he fidgeted and fussed about enthusiastically. Then, when he was distracted by a couple of younger males, a rival came in and completely destroyed the bower. He returned crestfallen and completed a quick inspection of the damage. Then he did something amazing. He didn’t post his misfortune on social media so that he could receive the appropriate amount of sympathy. He didn’t look for his rival’s bower so that he could extract revenge. And he didn’t give up on his goal. This delightful little bird picked up a stick and started building again. How should we respond when things go wrong and it seems that all of our hard work is wasted? Do what the bowerbird did and get back to work. I always try to pre-meditate on the worst possible outcomes. This way I have already experienced it before it happens and when it does I am ready for it. A great reminder and perfectly timed as always. I like to think hard work is never wasted. Hopefully, we learn a thing or two along the way. And besides, if we aren’t working towards something, we are probably not using our time very well. wow ! i like this great article….we should not waste time in complaining others….